Vaccines are useful tools to control avian influenza (AI), especially when biosecurity and stamping out strategies alone cannot successfully be implemented. Inactivated vaccines were the first to be developed in the late 1970s and are still the most widely used AI vaccines today. New technology vaccines have been progressively introduced into the field. The viral vector technology was first applied to the fowlpox (FP) virus with a first license in 1998. Newcastle disease virus (NDV) and herpesvirus of turkey (HVT) vector vaccines were developed later on (2006 and 2012, respectively). The influenza virus reverse genetics (rg) technology has allowed the genetic attenuation of highly pathogenic AI (HPAI); the first AI rgH5N1 inactivated vaccine (Re1) was developed in China in 2004. The baculovirus expression system technology (BEST) was recently (2014) used to develop subunit H5 vaccine. Two key issues of most existing AI vaccines are the poor broadness of protection and maternally-derived antibody (MDA) interference. These two issues may be potentially solved by a heterologous “prime-boost” vaccination strategy, in particular with a FP-vectored priming and an inactivated vaccine boost. The potency of AI inactivated vaccines are dependent on many parameters including the quality and quantity of antigen, the emulsion and the vaccine strain. The broadness of protection induced by these vaccines depends on all these factors, and not only on the vaccine strain. However, antigenic drift may occur in the field and the vaccine strain may sometimes need to be updated. The immune system of the chickens needs to be mature to get optimal immunogenicity for this type of vaccine; indeed, the HI titer induced in one-day-old chick is significantly lower than that induced in 2-week-old birds. Inactivated vaccine immunogenicity is also strongly impaired by MDAs. Both classical H5N9 inactivated vaccine (inH5N9) based on a LPAI Italian 1998 isolate and rgH5N1 (Re5) vaccine based on a H5N1 clade 2.3.4 isolate were used in the prime-boost studies. The FP-AI vaccine tested in prime-boost studies is the licensed product based on vFP89 which is expressing the HA from a H5N8 HPAI 1983 Irish isolate. One major advantage of this vaccine is the hatchery administered by the subcutaneous route at one-day-of-age. This vaccine alone is inducing a broad protection against challenge with many HPAI and LPAI isolates from 1959 to 2005. However, protection dramatically dropped when vaccinated birds were challenged against H5N1 antigenic variants that emerged later in different countries including Indonesia in 2006 and Egypt in 2008. FP-AI immunogenicity was found to be decreased mainly by anti-insert (AI) MDAs and much less by anti-vector (FP) MDAs. Priming with FP-AI at the hatchery followed by a boost with inactivated vaccine has been shown to induce a higher immune response than a single vaccination or even a double vaccination with inactivated vaccine. 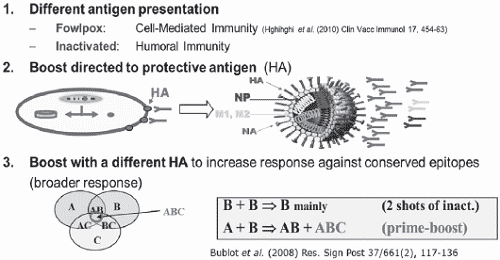 More importantly, the cross-reactivity of HI antibodies against heterologous antigen was much broader with the prime-boost vaccination regimen. The positive effect of prime-boost was even higher in birds with anti-H5 and anti-FP MDAs. The FP priming could overcome the MDA interference on the inactivated vaccine. In a vaccination challenge study with an Indonesian antigenic variant strain, the prime-boost vaccination had a clear synergistic effect on protection: the percentage of protection (100%) was higher than the additive protection from FP-AI (10%) or the inH5N9 (56%) alone (see Table 1). In another study, the FP-AI and Re5 rgH5N1 prime-boost regimen was tested against an antigenic variant Egyptian 2010 challenge. Although one administration of rgH5N1 vaccine induced very good levels of clinical protection, shedding and serology data indicated a better protective immune response with the prime boost regimen. This prime-boost was shown to induce a broad immunity in ducks as well. Table 1: Immunogenicity (HI titers in log2) and protection against a 2007 HPAI H5N1 antigenic variant from Indonesia induced by FP-AI (vFP89) or H5N9 inactivated vaccine alone or in a prime-boost scheme in birds with no (-) or FP MDAs (Richard-Mazet et al. 2014 Vet Res 45:107). The combination of vectored vaccine and classical inactivated vaccine in a heterologous prime-boost vaccination scheme has shown to induce stronger and broader immune response and protection compared to administration with a single type of vaccine. Furthermore, this heterologous prime-boost in birds with MDA may overcome MDA interference on inactivated vaccine. The boost could also work with the recently introduced BEST subunit vaccine. This FP-AI + BEST combination will be compatible with the DIVA strategy since detection of infected flocks will easily been done by serology using anti-NP ELISA. This work was supported by the French Ministry of Industry via LyonBioPole (Lyon, France) and the European Commission (FP6, NOVADUCK project). I thank all the people from SEPRL (Athens, GA, USA), IZSVe (Padova, Italy), VAR (Brussels, Belgium) and Boehringer Ingelheim R&D colleagues (Lyon, France and Gainesville, GA, USA) involved in this work.